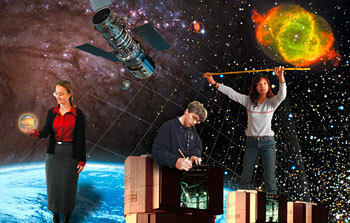 14 December 2001: The ESA/ESO Astronomy Exercise Series', published today, allows students to gain exciting hands-on experience in astronomy by making realistic calculations with data obtained by the world's best telescopes. The students measure and calculate the distances and ages of astronomical objects, among the most basic problems in modern astrophysics, using observations made by the NASA/ESA Hubble Space Telescope and ESO's Very Large Telescope. 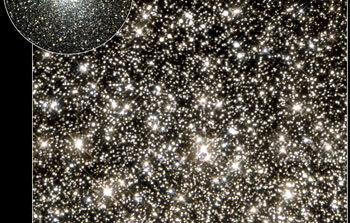 5 December 2001: Astronomers have observed a Dark Matter object directly for the first time. Images and spectra of a MACHO microlens - a nearby dwarf star that gravitationally focuses light from a star in another galaxy - were taken by the NASA/ESA Hubble Space Telescope and the European Southern Observatory's Very Large Telescope. The result is a strong confirmation of the theory that a large fraction of Dark Matter exists as small, faint stars in galaxies such as our Milky Way. 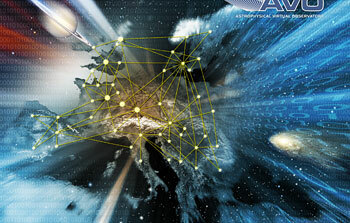 5 December 2001: A new European initiative called the Astrophysical Virtual Observatory (AVO) is being launched to provide astronomers with a breathtaking potential for new discoveries. It will enable them to seamlessly combine the data from both ground- and space-based telescopes which are making observations of the Universe across the whole range of wavelengths - from high-energy gamma rays through the ultraviolet and visible to the infrared and radio. 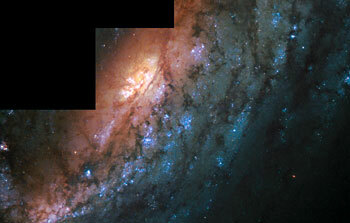 18 October 2001: A new image from the Hubble Space Telescope is an example of 'painting with light'. Astronomers use the separated colours produced by oxygen and hydrogen to investigate star-forming processes in the nebula NGC 2080. 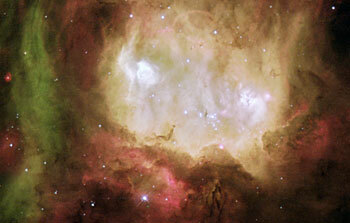 The colours explain much about the nature of such nebulae. 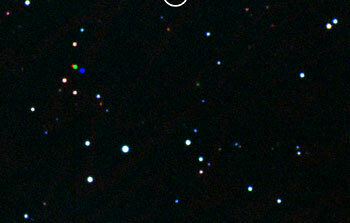 5 October 2001: A very small, faint galaxy - possibly one of the long sought `building blocks' of present-day galaxies - has been discovered by a collaboration between the Hubble Space Telescope and the Keck Telescopes at a tremendous distance of 13.4 billion light-years (based on the estimate of 14 billion years as the age of the Universe). 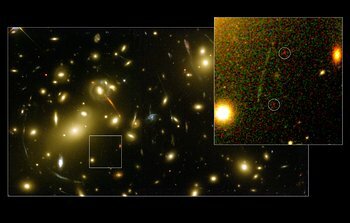 The discovery was made possible by examining small areas of sky viewed through massive intervening clusters of galaxies. These act as a powerful gravitational lens, magnifying distant objects and allowing scientists to probe how galaxies assemble at very early times. This has profound implications for our understanding of how and when the first stars and galaxies formed in the Universe. 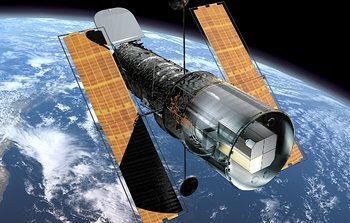 11 September 2001: The dedicated team effort to understand and correct systematic effects in observations from Hubble's Faint Object Spectrograph has now been concluded. In future astronomers who use the observations from this instrument will be able to measure the exact velocity of interstellar clouds, as well as the motions of individual parts of nebulae and galaxies. This will for instance lead to better determinations of black hole masses. 24 August 2001: A new, detailed Hubble image of a planetary nebula in the making shows for the first time the complex gas structures predicted by theory. 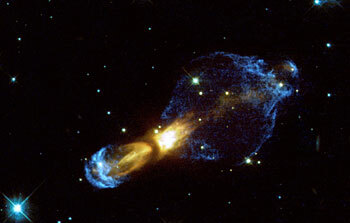 Astronomers are thrilled by observations showing the violent gas collisions that give rise to supersonic shock fronts. 23 August 2001: Ceres, the first asteroid (minor planet) to be discovered in the Solar System, has held the record as the largest known object of its kind for two centuries. However, recent observations at the European Southern Observatory with the world's first operational virtual telescope, Astrovirtel, have determined that the newly discovered distant asteroid '2001 KX76' is significantly larger, with a diameter of 1200 km, possibly even 1400 km. Surfing in Sagittarius - not for the faint-hearted! 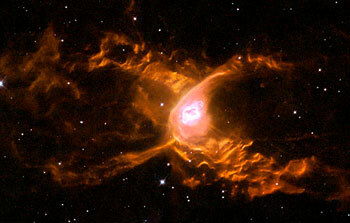 24 July 2001: Hubble observations have revealed huge waves sculpted in the Red Spider Nebula. This warm and windy planetary nebula harbours one of the hottest stars in the Universe and its powerful stellar winds generate waves 100 billion kilometres high - intimidating for even the bravest space surfers. 10 July 2001: The Double Cluster NGC 1850 found in one of our neighbouring galaxies, the Large Magellanic Cloud, is an eye-catching object. 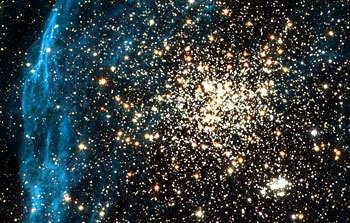 It is a young globular-like star cluster - a type of object unknown in our own Milky Way galaxy. 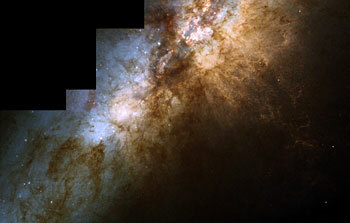 Moreover, NGC 1850 is surrounded by a pattern of filamentary nebulosity thought to have been created during supernova blasts. 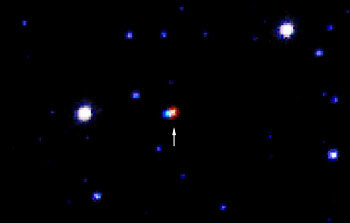 27 June 2001: Piercing the heart of a globular star cluster with its needle-sharp vision, the NASA/ESA Hubble Space Telescope has uncovered tantalising clues to what could potentially be a strange and unexpected population of wandering, planet-sized objects. 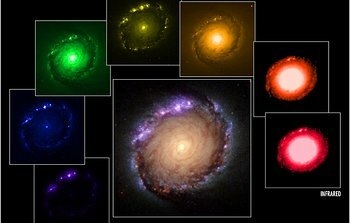 31 May 2001: An extensive, multi-wavelength study with the Hubble Space Telescope has shown the many faces of the galaxy NGC 1512. Hubble's unique vantage point high above the atmosphere allows scientists to see objects over a broad range of wavelengths from the ultraviolet to the infrared. 24 April 2001: To celebrate its eleventh birthday, the NASA/ESA Hubble Space Telescope has released an unsurpassed picture of the famous Horsehead nebula in Orion. 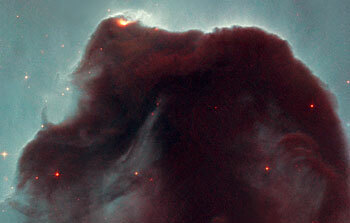 This dark nebula is part of the large Orion Complex, birthplace to thousands of stars. 28 March 2001: Extremely intense radiation from newly born, ultra-bright stars has blown a glowing spherical bubble in the nebula N83B. A new NASA/ESA Hubble Space Telescope image has helped to decipher the complex interplay of gas and radiation in a star-forming region of a nearby galaxy. The image graphically illustrates just how these massive stars sculpt their environment by generating powerful winds that alter the shape of the parent gaseous nebula. 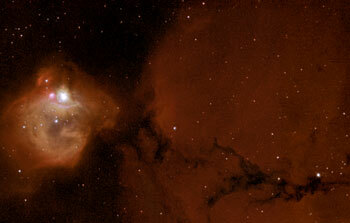 These processes are also seen in our own Milky Way in regions like the Orion Nebula. 7 March 2001: Beautiful, detailed Hubble images of the centre of the prototypical starburst galaxy M82 point to a violent past. An ancient burst of star formation that gave birth to more than 100 super star clusters is linked to a violent encounter with the galaxy's large neighbour, M81. 27 February 2001: Astronomers have long suspected that the bar systems that dominate the appearance of some spiral galaxies provide an efficient mechanism for fuelling star births at their centres. New results from the NASA/ESA Hubble Space Telescope provide evidence that this is indeed the case. 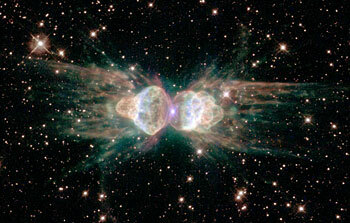 1 February 2001: Observed from ground-based telescopes, the so-called 'ant nebula' (Menzel 3, or Mz3) resembles the head and thorax of a common garden ant. This dramatic NASA/ESA Hubble Space Telescope image, showing 10 times more detail, reveals the 'ant's body' as a pair of fiery lobes protruding from a dying, Sun-like star.